We love this new watch from Hanhart which was created completely by accident! The company was experimenting with new dial colors on a new Primus model but when working with their dial partner a mistake was made in the dial production process leaving out the vibrant colors which instead were replaced by a grey palette of monochromatic colors. 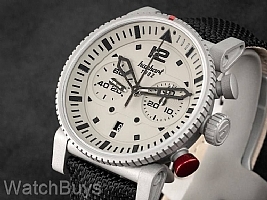 Once the Hanhart watchmakers saw the "mistake” they loved the look, and quickly realized that if they heavily bead blasted the case by hand to the color grey the dial and case would become one. Introducing the brand new Hanhart Primus Pilot Monochrome, now one of the hardest models to stock in the Hanhart Primus collection. This watch has an interesting lack of vibrant colors which on other watches might be boring but on this watch really works, especially in combination with the meticulously hand finished bead blasted case. One of the advantages to reducing the color palette is that the traditional Hanhart use of red at the bezel 12 marker and the reset pusher both really stand out. Visitors to our recent Road Shows in Chicago and New York were the first to see this new model and it instantly became one of the most talked about models at those two shows. To build this chronograph bicompax movement, Hanhart started with a Valjoux 7750 and then designed movement modifications to create the bicompax display. This new chronograph, like the entire collection, features Hanhart's distinctive trademarks, including the red push button developed as a warning to pilots for the reset function. The Hanhart engraved clasp is one of the best made that we have seen on any watch brand, and is also bead blasted. This watch is water resistant to 100 meters.